Achieving a superior level of quality while keeping costs competitive is the strategy that has helped Milwaukee Electronics stand out as a US-based electronics manufacturer. One key element for the success of this approach is the ability to provide resources and know-how which accommodates a variety of test solutions tailored to specific customer needs. “We serve a diverse set of companies who operate within a range of markets; some deal in low volume products, some in legacy products – others require manufacturing support for highly regulated products. Listening to our customers’ concerns and providing solutions for their preferred test strategy while factoring in test-related costs is one of our stronger areas of expertise,” said Dan Yantz, Engineering and Quality Manager at Milwaukee Electronics’ Portland facility. 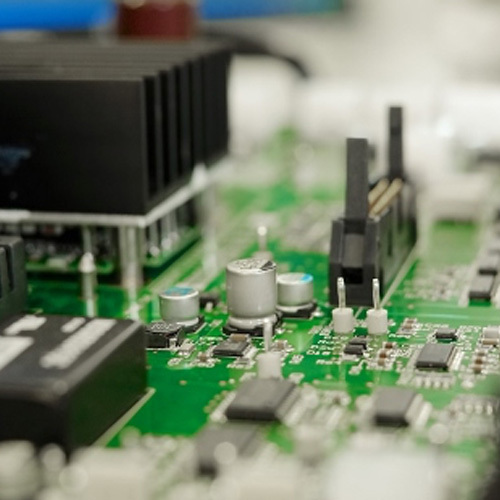 Our Portland, Oregon and Tecate, Mexico electronics assembly locations utilize a combination of test equipment to fulfill customer requirements; automated optical inspection (AOI), Checksum in-circuit testers, and custom functional testers. Our Milwaukee, Wisconsin facility has these capabilities as well as an additional HP 3070 in-circuit tester. Furthermore, the Design Engineering group in Milwaukee helps customers incorporate design for testability (DFT) principles into a design, and can develop custom functional testing equipment when necessary. Milwaukee Electronics’ Design Engineering group has the required skill and resources to support test fixture design/fabrication. 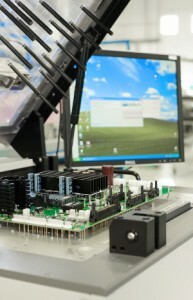 We can integrate custom requirements for the assembly of rack-based test systems with mechanical interfaces. 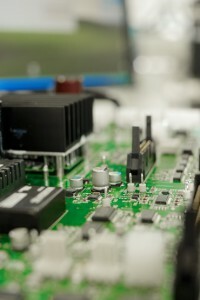 Our engineering group utilizes National Instruments’ Lab-VIEW system design software and our capabilities encompass standard electronics as well as electromechanical devices. Systems can incorporate the use of optical interfaces, or automated visual inspection with cameras. These custom functional test systems are typically best for low-to-medium volume levels of production. The group also designs in-line functional test equipment that includes a clam-shell box with the appropriate safety systems to protect employees from the high levels of voltage used during test. Generally used to support medium volume levels of in-line production, these systems typically utilize a National Instruments data acquisition card which is embedded inside the test box. Additional peripheral circuitry with varying amounts of voltage, along with a series of relays and switches interacting with test points though pogo pins allow for a rapid and accurate testing procedure. Our team can also provide PCB assembly solutions for situations of high degrees of test complexity within lower volume production using a Universal blue box functional tester – custom fabricated by the Design Engineering group. It integrates a higher voltage test range along with a standard logic test range with multiple channels on each. The system supports customized interface options with the product under test, by means of either a wire harness or pogo pins and uses a suite of modular test software also based on the National Instruments platform. 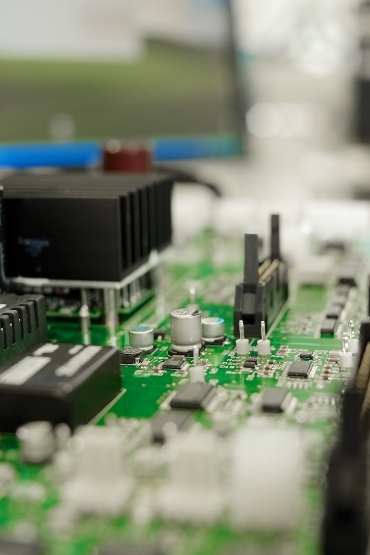 “We provide customers with an optimal test solution, tailored to meet their electronics assembly requirements as well as budgetary guidelines. If a customer needs to minimize costs for test fixturing we work within their parameters to provide the best fixtureless solution as is possible. We also support legacy functional test equipment,” Dan added.